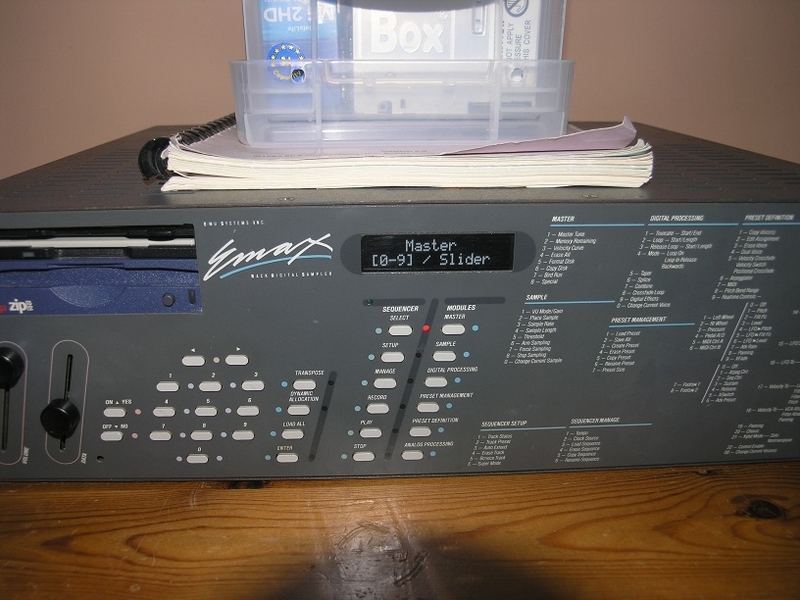 Emax | Welcome to the Emax SCSI Upgrade page. *** UPDATE*** I now have a testbed available, purchased an IC programmer, and can program and test the SCSI ICs again. If you don’t want to buy a programmer, learn how to use it, source the components, etc, etc – I am selling SCSI chipset kits again. With that said, the IC programs are STILL available for those who wish to DIY. WordPress will not allow me to post ZIP or binary files here, so to acquire the files, you will have to access the Yahoo! Emax Users Group (free to join) and navigate to the Files section. DISCLAIMER / AGREEMENT TO HOLD HARMLESS: You agree that the original poster, WordPress, the hosting site(s), Yahoo!, et al. are not liable for any damages (incidental, associated, or direct), equipment failure, repair costs, any other costs, claims, etc… arising from use, misuse, or negligence in relation to these files. The files come with no guarantee or support of any kind. The “PAL” files and EPROM IP424 .BIN are fully tested and known working. The other “BIN” files are the original, proprietary files from E-Mu Systems. EMAX 2 Memory IC Bundle – Completely untested. The “BIN” files are the original, proprietary files from E-Mu Systems. So there is always the query- where can I get rack ears for Emax? I don’t think you will find any premade, but here are 2 PDF images of the original rack ears directly scanned in. Sorry for the dark background, but I had to leave the lid up to scan it…. Print the PDFs below ( img012 and img013 ) to paper (make sure you don’t have any scaling changes) or take the PDFs to a machine shop, and they should be able to make them for you. To validate the sizing- this is a 3U height rack space. (1U = 1.75″) and considered an “L” bracket. So the dimension of the metal shown is 5.25″. The metal is 3/32″ thickness. The dimension with 2 holes shown is 5.25″ x 7/8″ from the edge to the outside FLAT Surface (90 degree bend) of the “L”. The dimension with 5 holes shown is 5.25″ x 13/16″ from the edge to the outside FLAT Surface. I don’t have a way to reliably measure the hole distances, but hopefully with the above dimensional information, the PDFs and pics\- when placed on a grid, the hole positioning can be confirmed. If you want them to match your Emax color (it could be gray or black), take them to a powder coating shop and have them match the color in the PDF. How should this connection be for this blue wire going to E-chip? And why is it there? Quickly- the “why” – I believe there was a voltage stability issue with power going to the E-chip. The resistor was added to resolve the problem. 1) You have a daughterboard with E-chip on it and there is a large 75 Ohm resistor on the piggyback board. (The resistor could be on the top or bottom of the daughterboard, but would definitely be on the daughterboard closest to the logic board edge with the blue connector (the edge just as in the picture below). I don’t have a pic of this configuration, but the circuit would be the same- you would want the blue wire from R19 to connect to the end of the 75 Ohm resistor NOT directly connected to pin 1 and 32. 2) You have a daughterboard with E-Chip on it, and there is NOT a large 75 ohm resistor on the Daughterboard. I would expect it to be sitting much like in the pic, nestled by the blue connector. 3) You have an E-Chip without a daughterboard and it should look exactly like the pic. ***The reality is this- even if you had a daughterboard, if you remove the Pin 1 and Pin 32 (the pins at each end of the E-chip on that side, like the picture) from the socket, and point them out, then solder to the pins and replicate the circuit per picture below, then it would be correct, no matter what rev board you have. My understanding is that some of the daughterboards just built the fix in…. Q: Can I upgrade the memory in my Emax 1 unit from the factory 512KB? A: No. The memory cannot be increased. This is a limitation of the device. Q: Can I upgrade the memory in my Emax 2 unit from the factory 1MB or 2MB to a larger amount (maximum 8MB) ? A: This depends on whether or not you have the memory expansion board and the proper PALs. 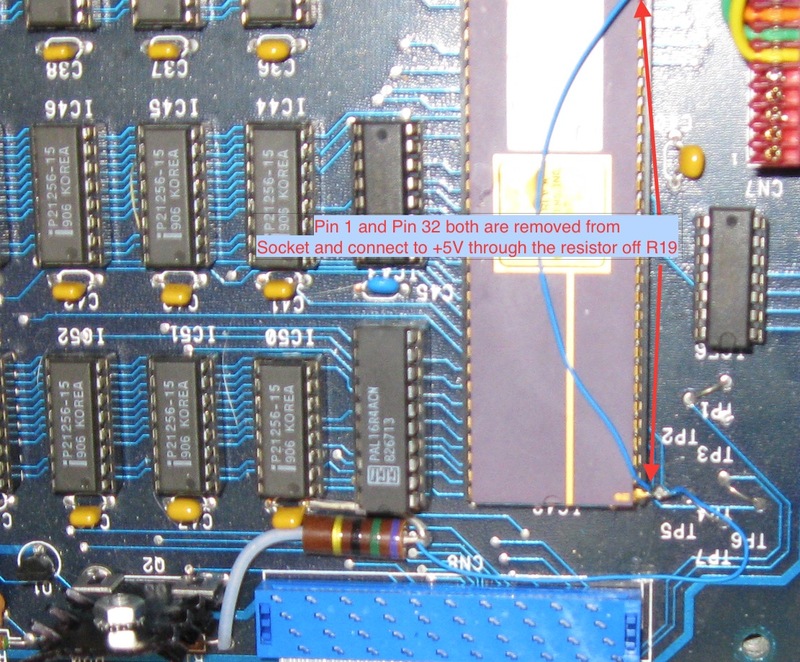 Assuming you do have the expansion board and it is populated with memory chips and the proper PALs installed, the memory may be enabled via the Scrambled Megs procedure. Some of the PAL / GAL memory IC files are now available on the Yahoo! Emax Users Group files section. Please review the Expansion guide and the available PAL/GAL files to see if you may be able to increase the available memory in your unit. The files are made freely available so you can program ICs yourself at minimal cost. Complete details regards the specific required PAL / GAL IC sets for each possible memory configuration are detailed in the guide. DISCLAIMER: Use of the PAL/GAL files are at your own risk, and have no inherent, explicit or implicit guarantee, warranty, or suitability for a specific purpose. They are provided solely on an “AS/IS” basis. Q: Can I upgrade my Emax 2 unit from MONO to STEREO? A: If you can find a kit (which are now very rare), it is possible. However, no one has been able to duplicate the STEREO PAL, and therefore it is usually easier to track down a unit which has already been updated to stereo. Further details regards the Stereo Upgrade are available in the Guide. Q: Can I upgrade / replace the EL foil Backlit display in my Emax 1 or 2? A: Yes, although part numbers and options vary. There are many replacement options available: stock replacement, Backlit LCD, VFD, OLED. Because of the available variety / options in display and changes to part numbers, etc which can occur, we will not link to any particular part here. Of note, many displays do not have the same pinout as the Emax, so a new display usually has to be hardwired, requiring some soldering skills / experience for proper installation. Local electronics shops or Synthesizer repair shops can usually perform this work for you. Q: Can I add SE capability to my Emax 1 unit? A: Yes, the SE Update file is availabe in the Emax Yahoo User’s Group files section (free, login required). Q: Can I add SCSI capability to my Emax 1 unit? Q: Can I replace the floppy drive with a new one, as the currently installed drive is not functioning properly? A: Yes, there are a couple of options, although there are some caveats. – standard PC 3.5″ drives will not work “out of the box” as they use the drive selection standard of A/B, while Emax uses a modified Schugart specification where the drive is set with DS0 (drive select 0) jumper. — most standard PC 3.5″ drives currently available at computer stores do not have a Drive Select (DS) jumper. – stock replacement drives may be available – Mitsubishi and TEAC are the most likely vendors to manufacture a capable replacement. – it is also possible to install a slim floppy by using an modified adapter. Q: Can I replace the floppy drive with one of the USB Floppy Emulators I have seen on the internet? A: There is one known working option for this: the HxC Floppy Emulator which has support for Emax. Note that “Gotek” and other non-branded Chinese floppy Emulators support DOS only. Emax uses a proprietary format, not DOS disks, therefore these other floppy emulators will not work. Q: Can I just remove the floppy drive and use Emax without it? A: The Emax does a boot search for the floppy and expects the floppy to be present. While it is possible to jumper the Floppy connector on the logic to ignore the floppy drive, it would then be impossible to perform diagnostics on the machine if it is failing to boot as the diagnostics is a special floppy disk. Q: Can I install an HxC Floppy Emulator along with the stock floppy drive? A: The Emax firmware does not allow for multiple floppy drives. This is the reason why SCSI was added to Emax. SCSI allows access to more banks by making multiple drives available to the unit ( up to 6 drives with 35 banks each for Emax 1, Emax 2 is 6 drives and 99 banks ). One Emax user added a switch on the power lines for the floppy and installed an HxC in parallel with a slim floppy. I cannot explicitly recommend this as a solution for the average user. Q: What kind of floppy disks can I use with Emax? A: Emax 1 and Emax 2 both use 3.5″ DSDD (double-sided double-density) disks. While it is possible to cover the HD (high density) hole on 3.5″ DSHD disks, the magnetic field of these disks is different. It is very likely the sound banks may corrupt over time due to magnetic field differences. It is recommended to purchase new DSDD disks. They are available from many vendors on the internet. Use of 3.5″ HD disks can result in “Data CRC Error” and “Disk Error!” messages. The messages can occur during format, write, or read of the incorrect disks. Note that a bad floppy drive (mis-alignment or failing read / write head) can also result in these messages as well. Q: Does the SCSI2SD drive unit work in an Emax? A: Yes, certain board revisions and Firmware versions may be applicable. The details are available at Gearslutz and also codesrc. Q: I need to repair my Emax 1 or 2 – is the service manual available? Q: I want to replace my Emax Hard drive with a flash media drive. Will any drive work? A: No, there is a list of qualified devices in the Yahoo Users Group database section. The short list of known working devices are: MicroTech PCD-15, MicroTech DPAI-SCSI (also called PCD-25B), SCM PCD-50b, SCM PCD-60b. Note 2: PCD-50b and PCD-60b may only use the PCMCIA slot. The other slots will not work with Emax. Note 3: Some IDE drives will work, but only where using an ACARD SCSI to IDE bridge (7220U / 7220UW). Other brand IDE bridges have been tested, but did not work. **** IMPORTANT: CF to IDE adapters that are available on the web / ebay which simply are made from a connector for CF and the IDE connector and no Logic chips on the board DO NOT WORK. These adapters do not take into account buffering, bus timing, etc. Q: Can I boot my Emax from an external drive (Flash media, Zip, or Hard drive)? A: Yes, assuming the drive (regardless of type) can be set to SCSI ID # 0, you should be able to boot from an external drive. Note: The above answer assumes you do not have an internal HD also set to SCSI ID # 0. Basic SCSI rules / guidelines apply. Additionally, the above answer assumes you are discussing a known Emax compatible drive. Q: Can I use an IDE hard disk in my Emax? A: Not without an ACARD 7720U/UW SCSI bridge. Emax does not have an IDE interface, only SCSI. Q: Can I use an Zip Drive with Emax? 2) An “External” SCSI Zip (or the external blue ones with dual interface (support for parallel and SCSI))- these are set to ID 5 or 6 and can be used, but Emax CANNOT boot from it. 3) An “Internal” ATAPI Zip can be used (either in Emax case or in external enclosure) where the ACARD 7220U/UW or ACARD 7226Q bridge is used to connect to the SCSI. SCSI ID 0 can be set on the SCSI bridge and Emax CAN boot from it. Q: What is the maximum size Hard Drive or media which can be used with Emax? A: Emax 1 can only use a formatted maximum size of 20MB (although 256MB flash media or 250MB Zip can certainly be used, you will never be able to USE more than 20MB of the media size). Emax 1 supports 35 banks per SCSI ID (these limitations are in the OS / firmware which cannot be modified). Emax II can use up to 1GB of size. Calculation of proper size depends on Emax II installed memory. Emax II can access 99 banks per SCSI ID. So if you have an Emax II 8MB unit 99 x 8MB = 792 MB. If the Emax II is 4MB, then 99 x 4MB= 396MB, and so forth. Q: What is the latest OS version for Emax II? A: OS version 2.14 is the latest and works in all Emax II’s that I am aware of. Q: What is the latest OS version for Emax 1? A: This is more complicated than for Emax II, because unlike Emax II, there are many variations which require different OS versions. The latest base version is OS 3.2 (which does not support SE features and also does not support SCSI features) – any Emax can boot with this OS. non-SE Emax (no SE) but Emax which does have SCSI should use HD 1.1 OS version (this version does not support SCSI ID other than 0 – so no external drives with this OS). NOTE: Attempts to boot an Emax 1 from an OS that supports features which are not installed in that particular Emax results in failure of the Emax to boot. Q: After I booted the Emax, I get a wrong software message when I switch floppy disks or switch to another HxC image? A: Emax does not have enough memory space to load the complete OS into memory. Every time the user chooses a section (example: Preset Definition) which is not already in memory – Emax at that time reads the instruction for the section which is requested from the disk. Because the way Emax OS is written on the disk- each section is at a specific location on the disk. The pointers to section locations on the disk are loaded on boot. Different OS versions do not have the sections in the same exact locations – as features changed or bugs were fixed, the code size would change, the sections would have to move on the disk to different sectors, and as a result the section pointers would also change. When a disk is physically swapped out (or new image selected, for HxC) and a different OS version resides in the newly inserted disk / selected image, the section locations and the pointers loaded into memory at boot are no longer in sync. Emax has no way to resync the pointers. Therefore, when Emax accesses the disk for “Preset Definition” and instead on this different OS, it finds “Preset Management” or lands in the middle of a code section instead of at the beginning of the expected section, Emax then displays an error message. It’s important that the Emax OS in use is consistent across all floppy disks / HxC images to avoid this issue. The Emax manuals do mention that where a new OS is available and in use, the new OS must be applied to all disks. This FAQ is for informational purposes only. The author assumes no liability for any use or mis-use of the information contained herein. All documents, trademarks, etc belong to their respective owners. 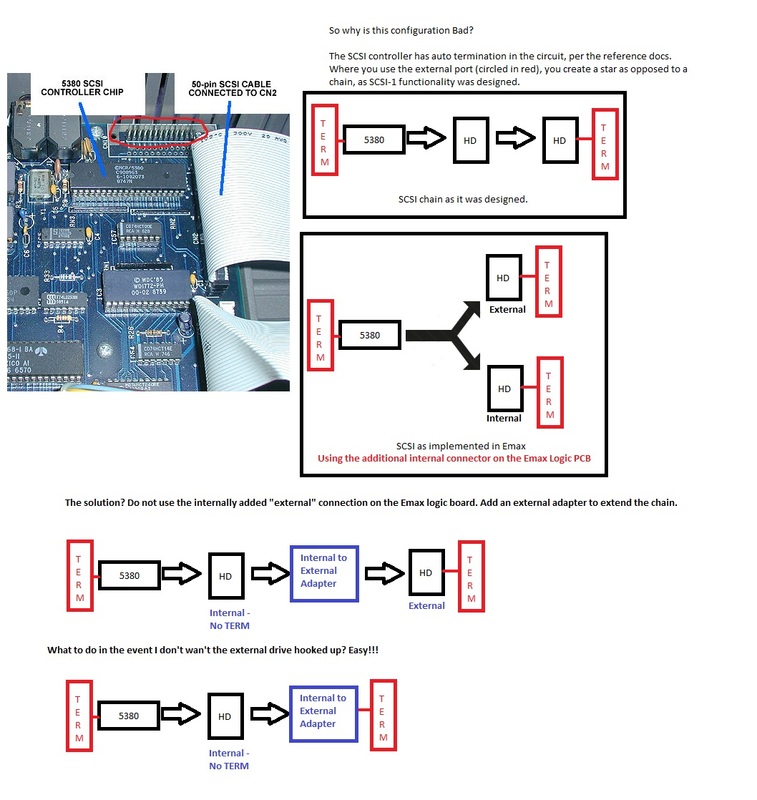 It seems I get questions regarding the scsi chain / setup fairly regularly, so decided to make this diagram, so hopefully it’s a bit more clear. OK- so with having done a couple of these OLED installs on Emax Rack mount units, I find that it is easy to break or miss a connection. In addition, it’s pretty hard to see and follow the traces without a magnifying glass and some pretty good light as well. So here is a pic so you can check that your display is making a connection. This is some useful information, even if you aren’t putting in an OLED display, just to check your connections aren’t bad…. For example, if your display is not working properly. NOTE: NC is for “No Connection”- the OLED display doesn’t use this pin. BUT – on LCD and LED and EL with Backlight, this pin is for the reflective angle. I felt the detail regards pin 1 and 2 of the display weren’t very good on the old picture, so I edited this new pic after consulting the Emax schematics and connector pinout confirmation for the ribbon. Hopefully this is a little better. It’s important to understand- I haven’t been able to find this pressed on connector that mates the ribbon to the board. So if the connections here become damaged on the connector itself due to overheat with the soldering iron – it will be quite the workaround to fix the connectivity. Jammie in United Kingdom did this Install of OLED for a customer. So this seems to be a common question that is easy to answer. A) If you have an Emax with a revision 1 board, it can’t be upgraded. B) If you have an Emax that is the HD or PLUS model – you already have the features this kit provides. C) If you have an Emax with a revision 2 or revision 3 board then the answer is MAYBE. If you open up your Emax, you need to look at some ICs and identify whether they are SCSI capable or not. First – the EPROM at location IC13. EPROMs that are marked IP424 and IP355 have SCSI functionality. There may be others, but I don’t know what the IP numbers are. Second – The SCSI TIM PAL (this is basically a “feature lock” chip). While you can get a 5380 SCSI controller and copy an EPROM easily enough and even install those chips, without this unlocking chip, SCSI will never work. The TIM PAL is located at IC49 on the end where the audio board connects to the main Emax logic board. TIM PAL ICs which are known to support SCSI are IP356 and IP379a. Other ICs with different IP numbers located at this position (for example IP344) DO NOT enable the SCSI functions. Third – Is there an 5380 SCSI controller in IC6 location? If you don’t have IC6, you don’t have working SCSI. This is the chip that talks to SCSI devices. So- if you have all 3 SCSI-capable items above – you have SCSI already, you don’t need a kit. If you have none of the 3 items above – you don’t have SCSI. If you want a SCSI kit, you may leave a comment for approval and I will contact you. Finally- If you have 1 & 2, but not 3 above… what do you do? Don’t buy a kit- you are paying too much!!! You can get a 5380 sometimes on eBay, from Electronics surplus, etc. I buy mine in quantity from UTSource from Hong Kong. While it takes about two weeks to get the item, it is inexpensive and I believe they will sell you a single one. As some persons do not understand the instructions I send for the modification or are not technically oriented I now have pictures for the procedure to modify the adapter. Perform Top and ITX cuts first, then PCB bottom modification. 1) Pin 1 (stripe edge) of the floppy ribbon cable should be closest to the rear of the Emax 1/2 unit where it is attached to the Emax Logic board. 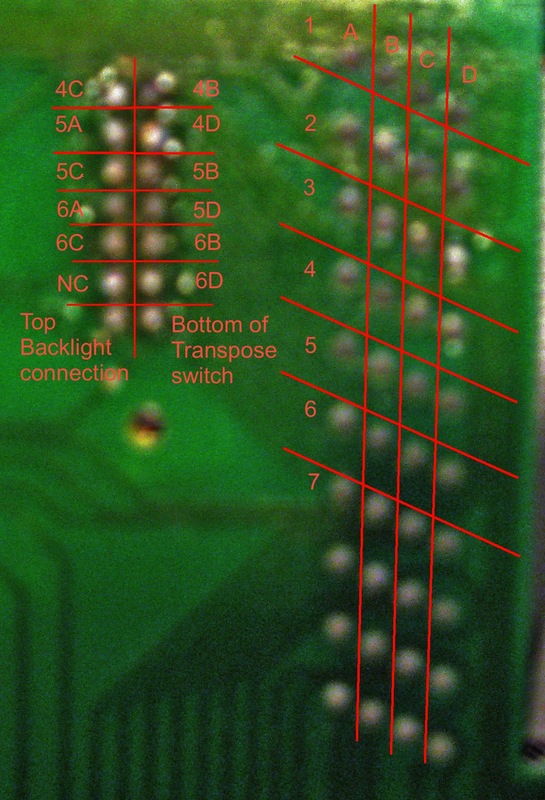 2) Where note #1 is correct, Pin 1 (Stripe edge) of the floppy ribbon cable goes closest to the ITX flat ribbon connector on the JM215A. 3) Some Emax 2 units have improperly keyed floppy cables that do not allow the plug to fit in the correct direction as per note #2 (the incorrect direction for the JM215A is where the stripe is nearest the power connector). In those cases, the cable can be replaced, or the plastic key preventing proper orientation can be removed using an exacto knife or similar. 4) Only a flat ITX ribbon with pins on opposing sides is correct for use with JM215A. Use of a flat ITX ribbon with pins on the same side may result in damage to the floppy drive or floppy control circuit in the Emax unit, requiring replacement of the drive and / or repair of the Emax drive circuit. Emax 1 PC Card drive – MicroTech DPAI-SCSI dual slot TARGET based drive- 70 banks!!! Dual Slot IDE (only 1 slot is available, using an Acard 7720 SCSI adapter).